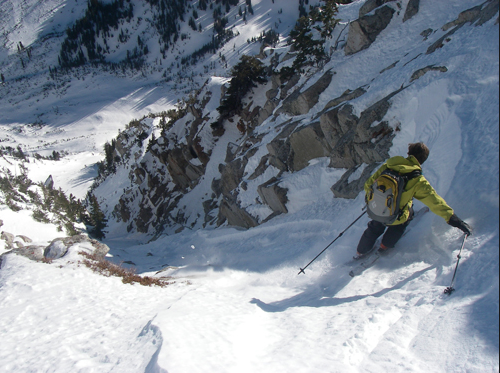 Ski Mountaineering is hard to explain to non-skiers. Why hike for hours or days, then risk avalanches and fatal falls to ski something miles from civilization when there are perfectly good ski resorts all over the country? It’s a tough sell to the uninitiated, but to those who do it, there is no doubt that floating over wild terrain on a surface of snow is one of the greatest gifts ever bestowed on mankind. With Fifty Classic Ski Descents of North America the problem of explaining the sport has been solved. Open the pages and see for yourself. • Twenty years ago many of the lines in this book were only skied in people’s dreams. In 2010, the time has come. Skiers have long since had the technical ability to ski big, steep lines, but it took a change in perspective to make it happen. Up until 1990, ski mountaineering in North America was focused on travel from Point A to B, and avalanche safety meant avoiding steep slopes. The bulk of the people getting into the sport came from a Nordic skiing background and fiddly ultra-light gear meant travel trumped turning. That has all changed with the advent of new materials, ultralight high performance boots and skis that double as rapid uphill transit and sure skiing machines on the down. Andrew contemplates his immediate future. Andrew holds a number of unique distinctions, yet here we will only mention those related to skiing. McLean has skied the ‘Big Three’ in Alaska—Denali, Foraker and Hunter—and has scribed descents on all seven continents. He also literally wrote the guidebook for the Wasatch, The Chuting Gallery. In his years designing climbing and skiing products at Black Diamond Equipment in Salt Lake City, Andrew, along with ski partner Alex Lowe, started ‘Dawn Patrol’ tours before work—a name and activity that is now common vernacular for skiers and alpinists. quote found in one of his notebooks. The Ski Mountaineer's Addiction - Andrew McLean's Passion.